Japanese consumer electronics giant Sony has unexpectedly said its annual loss may be more than four times bigger than initially forecast. The firm now expects a full-year loss of 230bn yen ($2.15bn; £1.3bn) compared with a previous estimate of 50bn yen. This was attributed to its struggling mobile business, which has been losing money due to competition from global rivals such as Apple and Samsung. Sony also said it would not pay a year-end dividend for the first time. In a statement, Sony said its latest plan had been "modified to address the significant change in the market and competitive environment of the mobile business." This is the sixth profit warning from the company, which made the announcement after Japanese stock markets had closed. Analysts say that while the company faces a hard time returning its smartphone division to profit, it is not impossible. "They are not the only smartphone vendors to be under a lot pressure," Rachel Lashford from consultancy Canalys said. "With the right restructuring and focus on products, at the right prices, it is absolutely possible for vendors to move forward." Ms Lashford said both South Korea's LG and Taiwan's HTC have seen their smartphone divisions return to profit after several straight quarterly losses. Sony has been struggling for several years, and now it has decided for the first time since it was listed on the Tokyo stock exchange not to pay a dividend to shareholders. The company blames the latest deterioration on its mobile phone business. It has struggled to compete with the dominant players in the smartphone market, Apple and Samsung as well newer Chinese suppliers. Sony plans to cut staff in the mobile phone unit by 15% to reduce costs. Sony's television business is also struggling, though other operations, notably the PlayStation games console, are more successful. 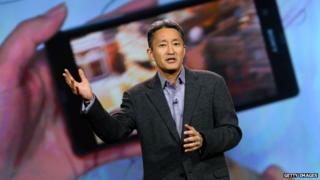 Sony has been losing money for the past few years and has undertaken a major restructuring to try and stem the losses. Once an investor darling, Sony has also seen its credit rating reduced to junk due to its poor financial performance. Under chief executive Kazuo Hirai - who took charge in 2012 - Sony sold off parts of the business deemed not central to the company's operations, including its personal computer business. It also sold its US office building in New York for more than $1bn, and the "Sony City Osaki" premises in Tokyo, which had been its headquarters for six decades. In addition, Sony culled 5,000 jobs from its computer and hard-hit television unit, which Mr Hirai has so far refused to sell because it is considered a core business. Sony's high-end Xperia smartphones have seen poor sales in China and the US because of local competition and limited distribution. In its search for new revenues, the company recently unveiled a new range of smartwatches and launched a smartphone that will allow gamers to integrate the device with its PS4 PlayStation console.